It's rainy season once again. It's time to bring out your umbrella and put on those raincoats and boots. With this kind of weather, what could be better than a hot bowl of noodles made fresh everyday? 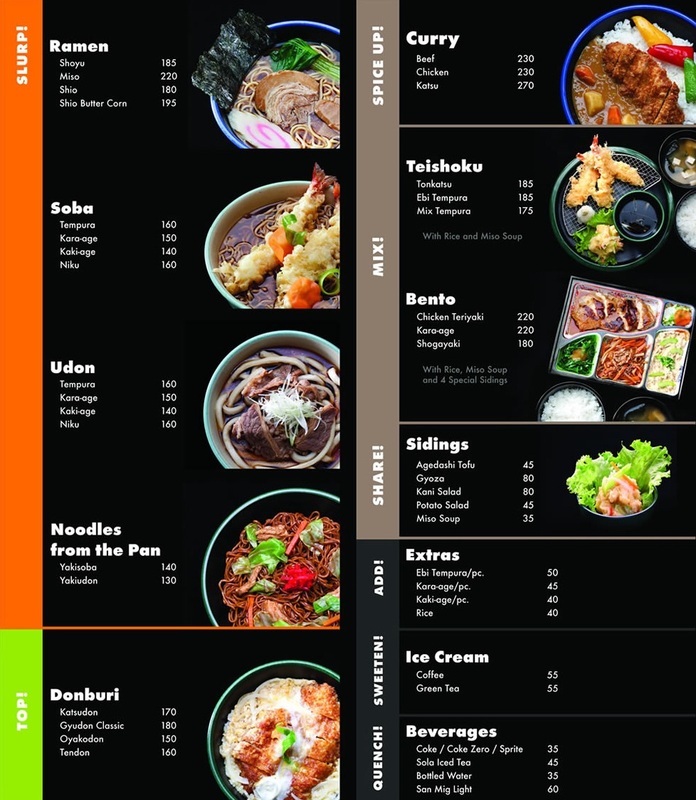 And while I am writing this up, I am currently craving for a bowl of ramen from Moshi Koshi which we just recently tried. But since I won't be able to leave work at this time, I'll just have to recall the sumptuous noodle feast we had last week at Moshi Koshi. A regular appetizer in most Japanese restaurants' menu like Moshi Koshi is their Gyoza- 4 pieces of soft pan-fried Japanese dumplings. It has a firm and chewy wrapper with meaty and tasty filling just right to tease your palate. To start the noodle feast is Moshi Koshi's best selling noodles. Moshi Koshi's noodles are freshly made in-store everyday with ingredients imported all the way from Japan. Suggested eating time for each noodle is indicated for the ultimate noodle experience. Shoyu Ramen is a soy-based broth with thin and chewy yellowish noodles topped with pork slices, veggies, bamboo shoots, nori and naruto (Japanese fish cake). I love the firm and chewy texture of the noodles which was just right and al dente. "Koshi" as they say which is the tender and chewy, firm but not hard, sweet state of noodles. 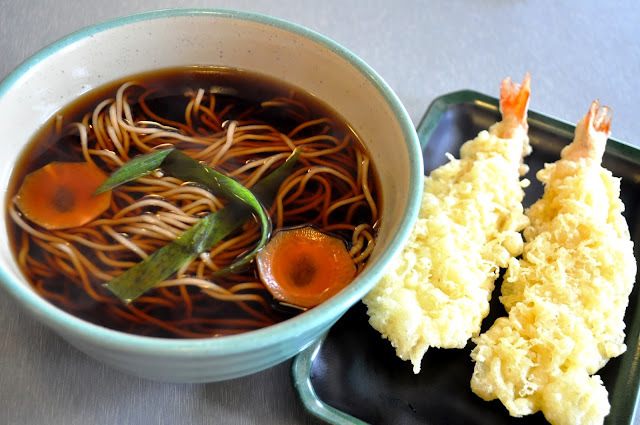 Next on the table was their Tempura Soba which is made from buckwheat flour and considered to be the healthy noodle. It is also the thinnest noodle among the three types of noodle they offer. The broth tasted the same with the Shoyu Ramen which was soy-based and the only difference was the noodles and toppings. 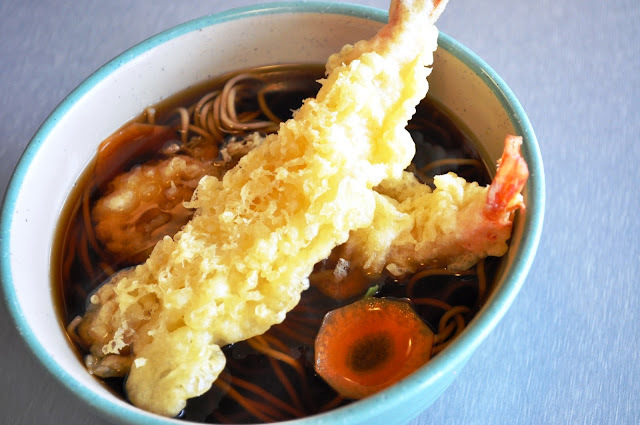 This bowl came with 2 large crunchy ebi tempura which can be served separately to retain its crunchiness. Again, the texture of their soba noodles was firm and al dente but softer than the ramen noodles. I guess that explains the 5 minutes suggested eating time. Although I personally prefer eating my soba noodles cold, Moshi Koshi's version was still enjoyable and even better than other cold soba I've tried. Honestly, I am not a fan of udon noodles as its thickness tends to make me full even before I finish my bowl. Albeit the simpler flavor of udon than ramen and soba, the beef slices gave the broth a sweet and savory taste somewhat similar to sukiyaki that made me enjoy this delightful bowl. A don buri classic of chopped pork fillet beautifully coated with egg. The pork itself was chunky compared to some katsudon I've tried which were basically thin pork fillet and thick coating. Underneath is a bowl of hot steamed sticky rice mixed with tonkatsu sauce which I wish was a bit sweeter. For those who prefer set meals, Moshi Koshi's bento boxes will surely tickle your fancy. Served with a hot bowl of miso soup and steamed rice, their bento also comes with 4 different kinds of special sidings. 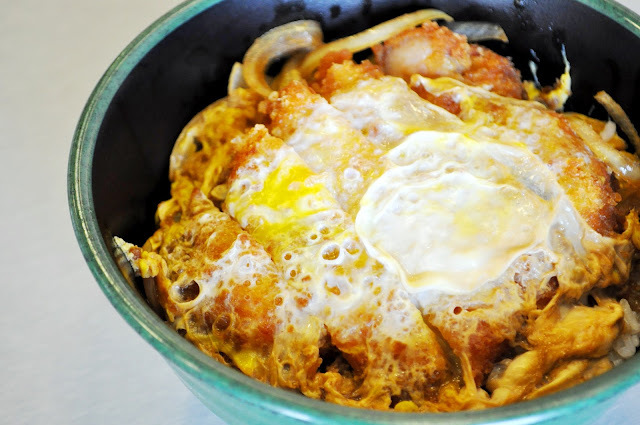 The best seller for their bento box set meal is the Kara-age Bento which is basically a 3-piece fried chicken cutlets which was crispy outside and tender inside. I love how each piece was really chunky with pure chicken meat goodness. 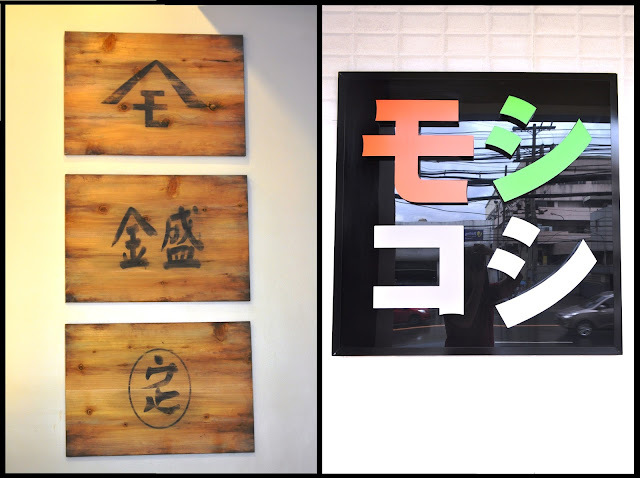 For dessert, Moshi Koshi offers 2 flavors of delicious cold treats- Green Tea and Coffee ice cream. Both flavors were not that sweet which was great, but I completely dig the green tea flavor. It has this strong green tea taste which I love and the texture was also smooth and creamy. Moshi Koshi Noodle Boss is definitely the place to go for those who want something hot in this cold and chilly weather today. Moshi Koshi is a place for people who wants to try authentic and fresh noodles but are on a tight budget as menu prices are really affordable and light on the pocket. wow tempura soba for only P160? that's crazy cool! im craving for green tea ice cream now!!! Love your food shots! I'm tempted to rush over there and eat more of their noodles. Those bento boxes are too cute! Compare to other noodle restaurant this is the REAL thing! damn I love the SOBA TEMPURA!!!! Cova Tapas Y Sangria - The New Bar in Town!